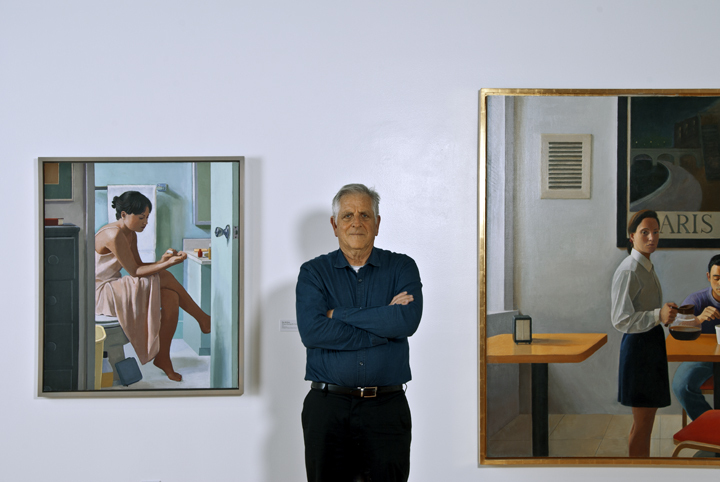 Painter Dan McCleary, who in 2010 founded Art Division, which serves young adult art students in the Rampart District of Los Angeles, has a deep feeling for human dignity. 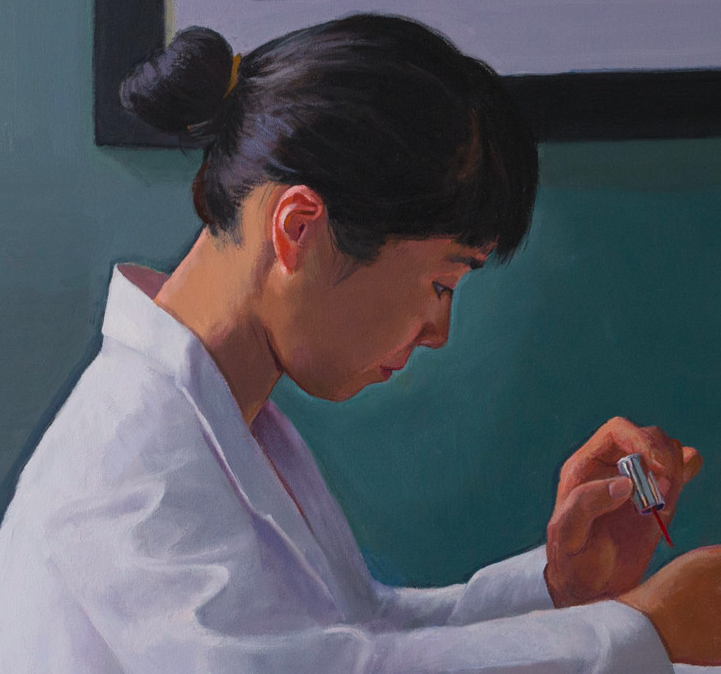 For more than 30 years McCleary has been painting models chosen from his friends and acquaintances, portraying them with equal doses of solemnity and candor. 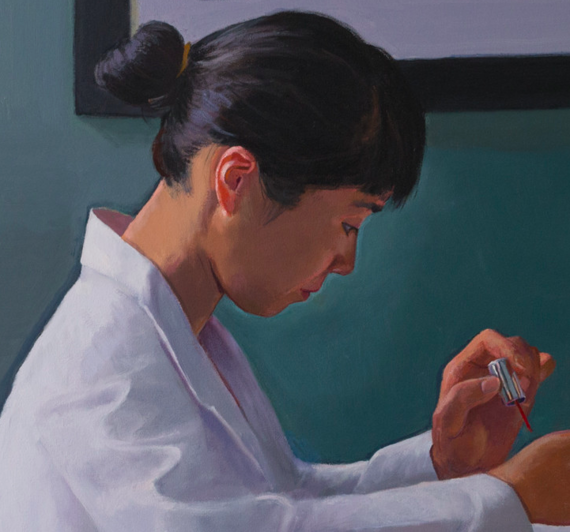 A carefully chosen selection of his works, now on view at the USC Fisher Museum of Art gives some indication of McCleary's accomplishments. 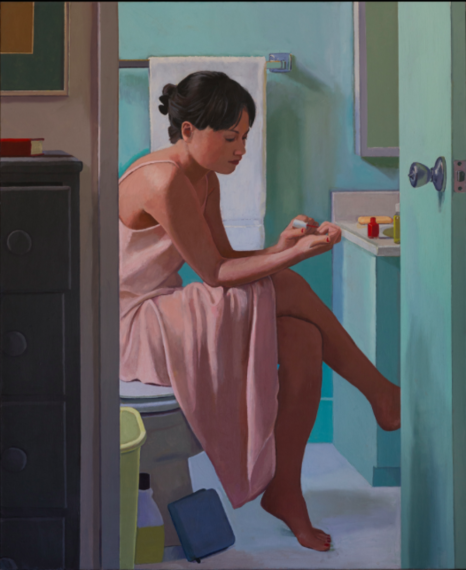 Christopher Knight of the Los Angeles Times says that McCleary "...is among the finest figurative painters working today." I recently asked Dan about his style, his working methods and his influences. 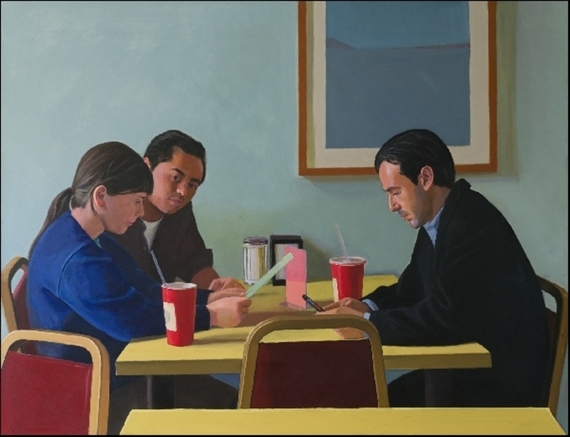 JS: How did you choose the paintings on view at USC from twenty years worth of work? DM: There was only space in the galleries for 16 paintings. 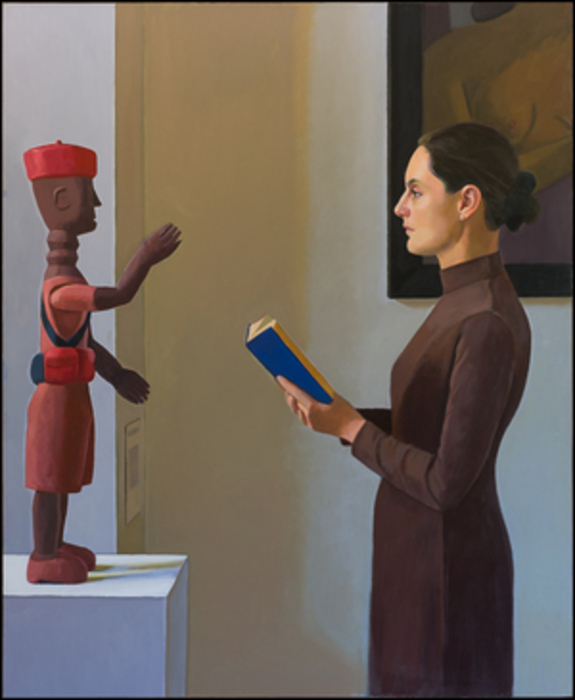 I worked closely with the curator, Ariadni Liokatis on selecting which works to show. She did an excellent job editing the paintings down to the 16 on display. JS: Tell me about the style and approach that characterizes your recent paintings. DM: In 1992 I had a job at the International School of Painting, Drawing and Sculpture in Umbria, Italy. 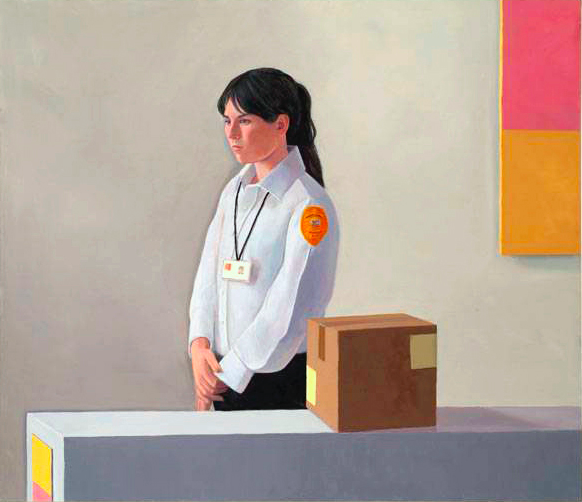 Wayne Thiebaud was on the faculty. Up until that point I was using a lot of earth colors. He introduced me to an Impressionist palette that employs pure color. It changed the way I worked. It was also the first time I saw in person the work of Giotto, Massaccio, Piero della Francesca and other Italian painters. That exposure had a huge effect on this body of work. I also became less reliant on working from photography and started working directly from life. I will have the model come and pose for drawings and sometimes a photograph. The models return many times and pose in sets I build in the studio. JS: Once you set up a scenario, how long does it take to complete a painting? DM: It can take up to nine months to finish a painting. I usually work on four or five painting simultaneously. I work two to three hours a day with the model and continue to work on the paintings alone. There are usually two or three models posing throughout the week. JS: Since you now have a studio next door to Art Division, where you teach, do you let students observe your process? DM: For about 3 years a student Emmanuel Galvez had a studio in my studio. I think it was helpful to him to see how a painting is put together from beginning to end. He is doing really well and is getting ready for his second exhibit at Craig Krull Gallery. I am preparing for an exhibit at Vita Art Center in Ventura that will feature portraits of the students. Other students will work alongside me. JS: Tell me about your painting Woman Painting Her Nails. 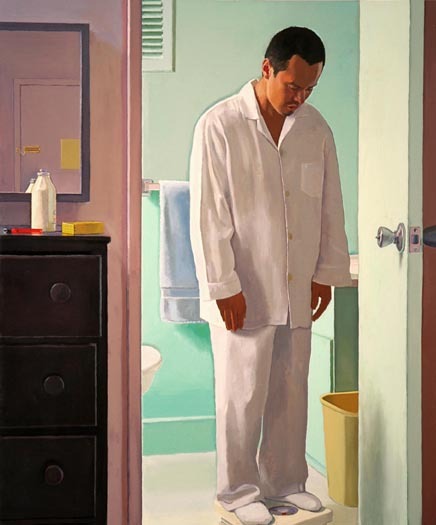 DM: That was one of a pair of paintings I did using a bathroom as their setting: the other is Man Weighing Himself. 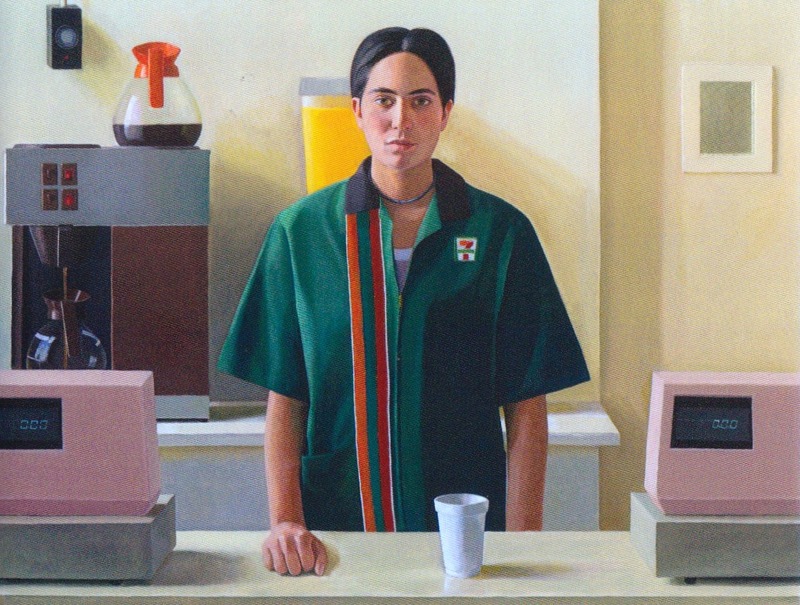 In many of my paintings women are doing rather androgynous activities, for example working in restaurants and I decided that I wanted to try making a really feminine painting. I talked a number of women friends as to how they did their nails. I tried to recreate that act as closely as possible. 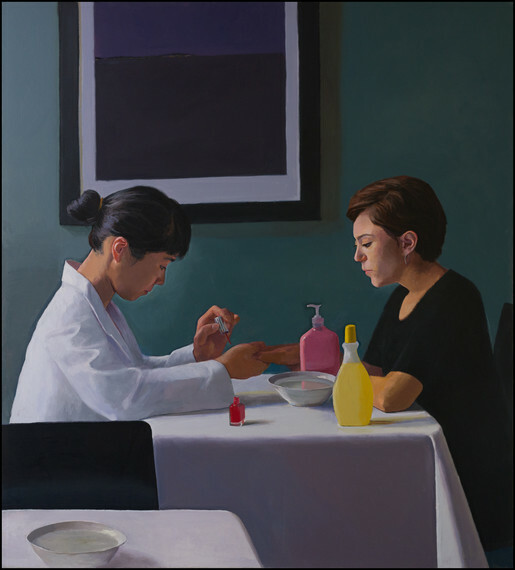 The finished painting is seen from a child's point of view, as if they are watching their sister or mother getting ready for the day or evening. JS: Even though you are depicting something private you seem very interested in giving your model dignity. DM: I want to keep a prudent distance from the model. The people I paint are always people I have respect for. I have to have some sort of connection to them. JS: What kind of working attitude do you bring to the studio? DM: For me, painting is just working. It requires a lot of time alone which I enjoy. JS: Even though you work from live models, you have mentioned that memory plays a role in your work too. DM: I relied heavily on memory when I did the Seven-Eleven painting. 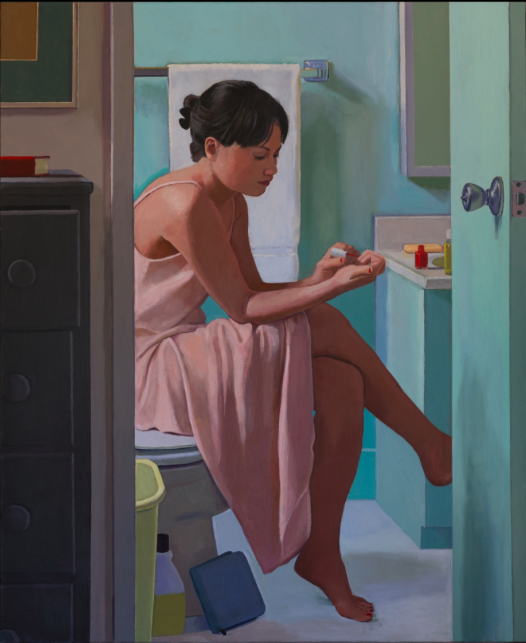 When I went back to the actual Seven-Eleven store it looked nothing the set I put together in the studio The two bathroom paintings are based on my memory of the bathroom we had when I was a child, In actuality it may have looked nothing like the one in the painting. I do remember the color -- that sort of aqua -- but I'm not sure if that color was actually there. JS: Who are some of the artists you have been looking at recently? DM: I continue to look at Vermeer and Manet. I'm also interested Euan Uglow: I'm really curious about the way he works. 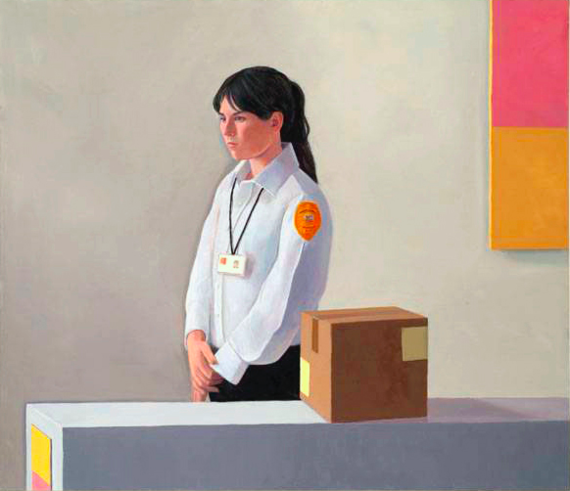 JS: You have been a representational painter in the era of Postmodernism: how has your career progressed in that context? 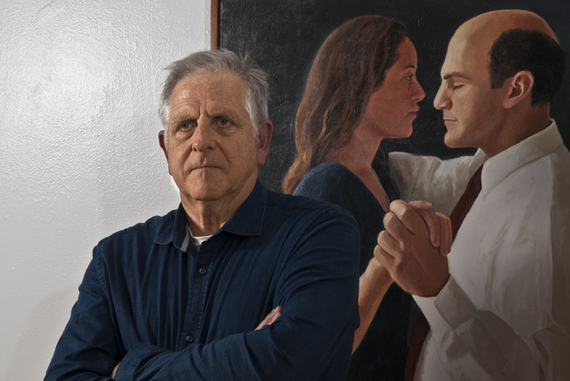 DM: I never felt like I was an "outsider" making figurative art. In the Bay Area where I lived for 6 years in the 70's and got started there is a great tradition of figurative art. 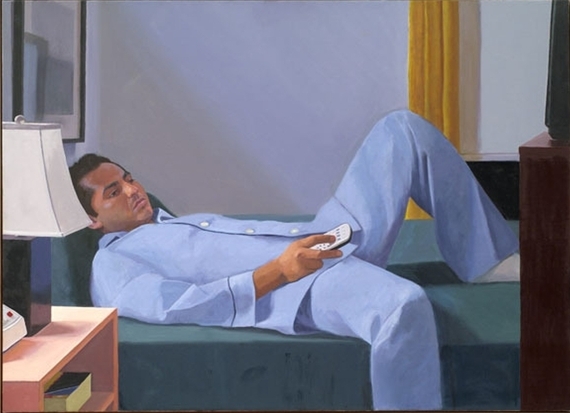 I discovered David Hockney's work in the early 70's and it had a huge impact on my work I also liked the paintings of Eric Fischl and Alfred Leslie. I never felt I was an odd man out. John Sonsini and I talk to almost daily and I also keep in close contact with John Nava. I was also very close with Mark Stock, who recently passed away. I have always felt like I had a community of like-minded artists. JS: How has being at Art Division changed you and your work? DM: It's a big change opening the school. I am no longer in a cloistered world: my studio is right next door to the library and there is a constant flow of people in and out of my world and my studio. I have very little privacy but it's a pleasurable trade off. Life at 62 is very different from life at 32 or 42. I feel more in charge of things. I try to work 6 days a week and take Sunday off.